"Give your Thanksgiving dinner a twist this year. You will be pleasantly surprised at the indescribable flavor of this turkey. Well, WOW comes to mind. I got the general recipe from a German friend of mine with an added twist of my own. I have had so many raves about my turkey that everyone now comes to my house on Thanksgiving. Definitely a crowd pleaser, there has never been left over turkey at my house. Thanks Evelyn :)"
Rinse the turkey, pat dry and place in a large roasting pan. Insert the onion, carrot, and celery into the cavity of the bird. Poke holes in the apple and orange so they will release their juices, and stuff them into the bird. You may have to cut some things in half to get them all inside. Spread oil all over the outside of the bird, and season with salt, pepper and soul food seasoning. Place the turkey into an oven bag, and set back into the pan with the breast facing up. Lay strips of bacon over the entire top. Close the bag. Roast the turkey for about 4 hours, or until the internal temperature reaches 180 degrees F (82 degrees C) when taken in the thickest part of the thigh. Let the turkey rest for 10 or 15 minutes before carving, and use the drippings in your favorite gravy recipe. 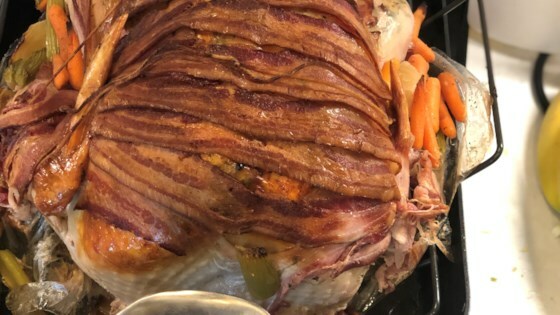 See how to take turkey to the next level with bacon! To get ahead for the big day, you can prepare turkey the night before, then refrigerate and roast the next day. Learn more about how to cook a turkey for Thanksgiving in our How to Cook a Turkey article! The turkey came out very dry and the bacon was burnt onto the turkey. I followed the recipe to the T. Just didn't trun out very well. This turkey was wonderful, very moist. It was the best turkey I have ever fixed. I did have to cut up the veggies, apple and orange so they would fit in the cavity. Again, it was terrific! !